The Inspiration Behind the Legend! 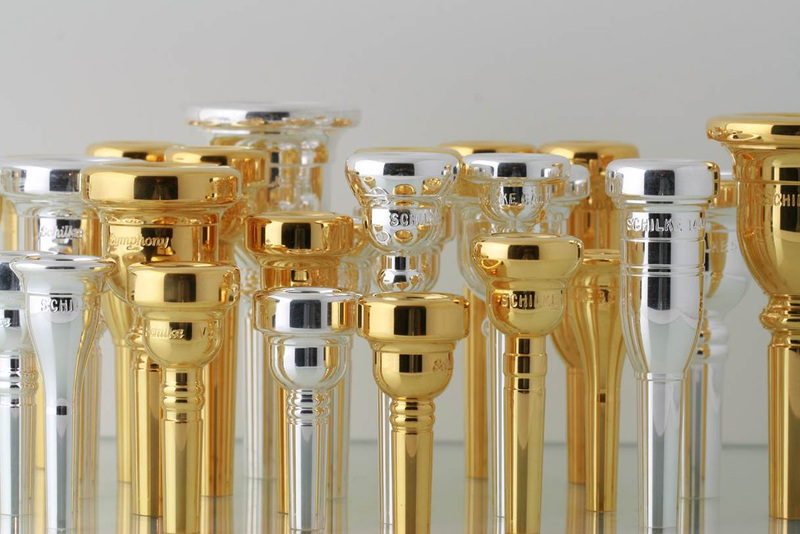 For 60 years the Schilke Music Products has been a leader in trumpet mouthpiece design and manufacturing in the world. Many of our trumpets models are classic, unique and have become industry standards. Renold Schilke and William Scarlett, a Schilke employee and student of Renold O. Schilke before his appointment as 4th trumpet in the Chicago Symphony Orchestra in 1964, developed the Schilke mouthpiece labeling system. The labeling system we still use today allows a player to quickly understand how one model relates to another within mouthpiece line. Prior to this nomenclature, Schilke labeled the mouthpieces using a single letter designation. These mouthpieces were a collaboration with trumpet artists and colleagues of Renold Schilke from 1950’s and early 1960’s. Our standard mouthpiece line is a result of these associations with many of the finest players and teachers of the era. Here are a few brief stories that have been passed down over time regarding some of our earliest most popular models that went on to become standard in our line up and are still available for purchase today! Schilke Trumpet Model 9 – Formerly the Model ‘B’, the mouthpiece includes the design of the former principal trumpet of the Chicago Symphony Orchestra, Edward B Lewellyn who was a teacher and mentor to Renold Schilke. Described as, “Permits a large superior tone without sacrificing the upper range.” This model was actually produced by Schilke prior to the formation of his company and compares approximately to a 10 1/2C. Schilke Trumpet Model 11 – Formerly the Model ‘H’, Described originally as, “A superior mouthpiece with maximum number of medium (average) characteristics. It is free blowing with good intonation control.” This model is attributed to Adolph Herseth, the legendary former principal trumpet of the Chicago Symphony Orchestra. Schilke performed briefly with Herseth in the Chicago Symphony and also was a founding member of the Chicago Symphony Brass Quintet. It compares approximately to a 7C that he used early in his career. Schilke Trumpet Model 12 – Formerly the Model ‘J’, attributed to Chicago teacher and player Joseph Summerhill, who taught at the American Conservatory of Music, was a colleague of Renold Schilke and a former student of Elden Benge. Originally described as, “Good range with all the desired medium characteristics. Used extensively by studio and dance players.” It compares approximately to a 6C. Schilke Trumpet Model 18 – Formerly the Model ‘R’, attributed to Renold O. Schilke, founder of the Schilke Music Products in 1956, former member of the Chicago Symphony Orchestra, educator with teaching positions at Northwestern University, Depaul University, and Roosevelt College. It compares approximately to a 1C. It is described as, “Though comparatively large, it feels smaller because the high point the rim is nearer to the center of the mouthpiece. Endurance is good because more of the lip is ‘working’. A strong embower is desirable.” The Schilke 20 (formerly Model R10), 22 (formerly Model R20), and 24 (formerly Model R30) are all based on the 18 but incrementally bigger by .01” (.254 mm). 6A4a – “Artist Model” originally developed for Bill Chase, Lead trumpet player with Woody Herman and leader of the jazz-rock fusion band Chase. 13B – “Artist Model” originally developed for legendary Chicago educator, performer and colleague of Renold O. Schilke, Frank Lisanti. 13A4a – “Artist Model” originally developed for Mike Vax while working as lead trumpet with Stan Kenton Orchestra. 14A4a – “Artist Model” originally developed for Forrest Buchtel former trumpet with Woody Herman, Blood Sweat & Tears and the legendary San Francisco-based Latin rock band Malo. 16C4 – “Artist Model” originally developed for Thomas Stevens, former principal trumpet of the Los Angeles Philharmonic from 1972 -2000. It compares closely in feel to a 1 1/2C used by Stevens at that time. 20D2d – “Artist Model” originally developed for George Mager, former principal trumpet of the Boston Symphony Orchestra from 1919 until his passing in 1950. Mager was on the faculty of the New England Conservatory, and was a teacher to some of the most influential trumpeters of the mid-twentieth century, including both Adolph Herseth and Renold Schilke. This creative collaborative process in mouthpiece design has continued to this day at Schilke Music Products. Many of the new models recently released within the last decade were developed with a player’s feedback. Jon Faddis is one great example of collaboration. Jon has been playing Schilke for over 45 years. We have made him numerous mouthpieces over that period. We currently produce a signature mouthpiece stamped “Faddis” with an unique XL heavyweight blank, extra shallow cup and tight backbore. Schilke Music Product continued working with professionals is most evident in the development of the “Symphony Series” line. The rim shape and contour of the “Symphony Series” is based on the classic ‘1CH’ rim and digitally adjusted to different sizes. Initially we started with three rim sizes, 1,2, and 3. The 150 rim models were developed working with Jack Sutte, 2nd trumpet in the Cleveland Orchestra for a size between a 1 and 2 rim. The M2X was created upon request from several New York based players and dealer feedback. It has the Symphony Series 2 rim with the 1cup for a slightly bigger feel. We eventually found the demand for some smaller sizes developing the M5C and M4C models. The M4C is unique because it bridges the gap between the traditional 3C and 5C sizing for something in between. The F cup models were originally developed for the Houston Ballet Orchestra trumpet section. The mouthpiece originally known as the “fluffy” has a flugel style cup and trumpet stem with the same rim contour and feel as the other models in this series. This has been a very popular custom choice for quieter passages where a cornet sound is desired without losing the control and focus of the sound. Working on custom mouthpieces with American Jazz trumpeter Ryan Kisor, lead trumpet with the Lincoln Center Jazz Orchestra, we developed the new “Symphony Series” lead mouthpieces S3, S4 and S5 models. Utilizing the rim shape of Symphony Series line with the Faddis cup throat and backbore, we created a new line of high compression lead mouthpieces that have been well received. As we see the demand, we will continue exploring avenues within the Symphony Series concept to add new things that are needed or interesting for the contemporary trumpet player. Many of the Schilke trumpet mouthpiece models are deemed classics and have an interesting connection to many of the finest trumpet players and teachers of the late 20th century. Schilke quickly developed a reputation for trouble shooting, improving a mouthpiece and making slight alterations to a mouthpiece to improve a player’s set up. In some cases, models were created to meet demand. Those choices were picked with a premium based on sound production and response. The flexibility to manipulate the sound in both color and dynamic range (ppp-fff) is paramount to a successful performance! Please take a moment to try some of these time tested classics as well as our newest creations. I am sure you will find a Schilke mouthpiece that will improve your overall sound and approach to your style of playing. Please contact Schilke Music Products, a Schilke dealer or visit our showroom located in Melrose Park, IL with any questions regarding our Schilke mouthpiece line.